In the two part half-blind demo post, I created the sockets entirely with the chisels. 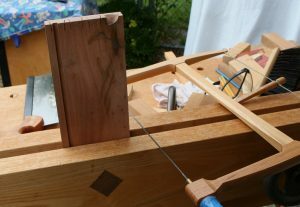 However, I will often use a back saw to define the edges of the sockets. Because this is not a through cut, you will only go down roughly half way. 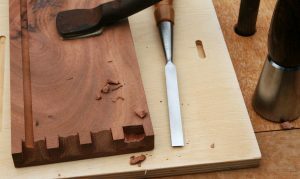 When dealing with tough stock such as bubinga or the highly-figured mahogany shown here, I will also scoop out part of the material using my bowsaw. That saves a bit of wear and tear on the chisel edges and the aging operator’s joints. Result of boundary cuts and scoops.